I even fixed my hair today for the occasion, which apparently is more of a rarity than I thought since many people have commented. 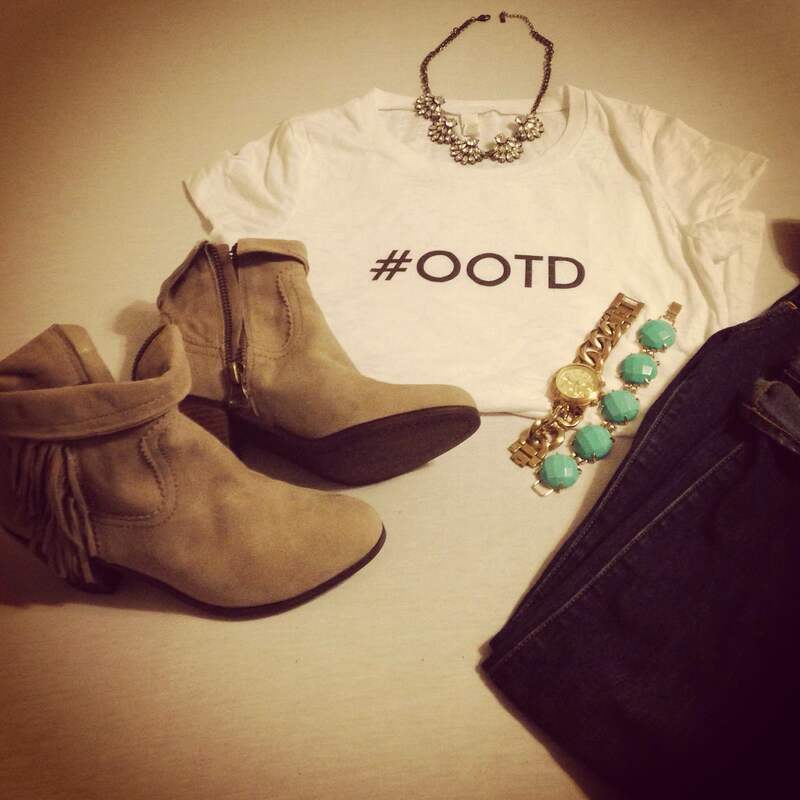 T-shirt with the trending fashion hashtag #ootd can be found below. This shirt makes it easier for people to know this is your outfit of the day. Kidding. It’s real purpose is to remove people from your life that question why you would wear a shirt with a trending hashtag on it. You don’t need that kind of negativity. The fringe booties are my favorite fall shoe. And they were 15% off at Nordstrom. I will always pick suede over any other material, and I’m partial to nudes this season, although it was tempting to order a pair of the black as well. I paired the top and boots with straight fit ankle denim. I would prefer distressed but did not want to wear distressed denim and a t-shirt (fashionable t-shirt) to the office. Accessories include my over-sized Michael Kors link watch, bling BaubleBar necklace, and Large Kendra Scott turquoise bracelet. Bigger is better (#Texas). love that t shirt 😉 it seems t shirts are in again!